A whole lot of information has been leaked on a lot of things Microsoft related. An online survey site Intellisponse accidentally what could be Microsoft’s E3 line-up this year. 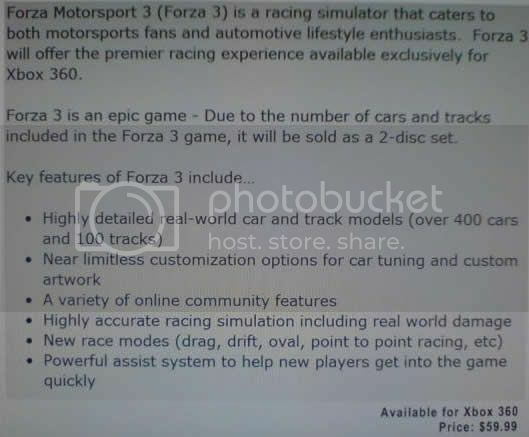 This is a very big list of stuff which ranges from what could be Microsoft’s own Mii like characters, Lips and and information on Forza 3. This list was taken from Neogaf and remember until confirmed don’t bet on all of this being real. -Guitar Hero 4 to cost 179.99 with instruments. New guitar sets you free: New touch-sensitive guitar Neck Slide opens up the entire guitar neck for unbound solos – shred how you want. Jimi Hendrix, The Doors, Foo Fighters, Smashing Pumpkins, Korn, System of a Down, Ozzy Osbourne, Interpol, Muse “and dozens more”. -Lips is a music and singing game that includes 30 songs, 2 wireless interactive microphones, the ability to use and sing your own music or downloaded songs from an online service. Designed to have fun with friends, Lips scores you on your singing (pitch, rhythm, and tune) and overall performance. Wireless mics are interactive, with lights on the shaft of the microphone that pulse to the rhythm of your voice, and motion sensors that allow you to dance, move or swing to score points. “Introducing the ability to play the latest console games (i.e. Xbox 360, PS3, Wii, etc.) on your PC. Many of these games are only available on consoles today and with this new feature would now be available on the PC as well. With this new feature those console games are now playable on your PC! Avatars : With hundreds of clothing options to choose from your ‘Avatar’ can truly reflect you each and every day! Spend a few minutes or a few hours building and outfitting your ‘Avatar’ to reflect the real you. The choice is yours. Your ‘Avatar’ will represent you as you jump into various arcade and retail games. You’ll be playing in the games! Scene It? Pop Culture Edition – trivia challenges about movie, music and pop culture. – Ultimate Band (Wii/PS3/X360) – another band game? There is a game called ‘Crucible’.